Breeder's Cup wagering down over 20% from last year's record numbers. No coverage in Ontario other than HPI, and I have over 200 channels. Is horse racing dying? Overall TV ratings stagnant for Breeders. Brian Lynch and Patrick Husbands are hot, while Dean Deverell and Gerry Olguin are not. The Juvenile Filly race has longshot written all over it. I'm going to go with Grace Anatomy despite a bad post. She made one of those neat middle moves last time and will probably run a peak performance this time out. The question is, will her peak performance be good enough? Favourite War Pass is the horse to beat in the boy's Juvenile. And when I come up with a favourite, that horse must look pretty good. Wait A Minute may just do the trick in the Filly and Mare Turf. She should be 1-2-3 at least. I can't believe that a filly can go 7 for 7 (Nashoba's Key). She is due to bounce big time:) Edited 10:15 AM Oct. 27th: Wait A Minute is scratched. I'm now going with All My Loving because I'm still a Beatles fan. I'm going out on a limb in the Sprint. I like Forefathers. Nothing wrong with him at the distance, and his current speed is as good as anything in the field. I don't like layoff horses in general, and especially in the Breeder's Cup, and it seems that the top figure horses haven't been out since September 1st in this event. But if a layoff (more than 30 days away) wins, the sprint is the most likely event for that to take place. In the Cup Mile I'm going with Jeremy. I don't follow Europe racing at all, but something really caught my eye with Jeremy. On June 19 both he and Excellent Art (the program fave) both ran a mile at Ascot in separate events. Both won, but Jeremy's time was a full 2 seconds faster. I'm sure there was some sort of explanation, because when they hooked up August 1st, Excellent Art finished 2 lengths of Jeremy and was even more heavily bet than Jeremy. But that 2 second differential has me going with Jeremy tomorrow. Stronach has a great chance in the Filly Distaff with Ginger Punch. Again, she looks like she is rounding into a peak race as she gave it up late last time. In the Breeder's Cup Turf I'm going with Dylan Thomas the favorite. 2:28:2 going about 1 mile and a half in France just has to be a tough time to beat. I had to flip a coin between Street Sense and Curlin. Street Sense won the coin toss at least, he is my pick. Lawyer Ron has the numbers, but at 0 for 3 at the distance, I have to pass on him. Bonus pick: If you are awake at 11 in the morning, put a couple of bucks on Stunt Man in the first at Monmouth. Edited 10:15 AM Oct. 27th: Stunt Man is scratched. Go back to bed. Still no decision concerning Fort Erie. Apparently the government has made an offer of some sort, but it has to meet the approval of Nordic. So it obviously isn't the $7 million originally being asked for. Again, I can't see how the government can give Nordic one thin dime, but I can see the government helping out the horsemen's purse account. The thing is that since Nordic has to approve the government's offering, I can't see them letting the horsemen have anything substantial. They argue that it costs them money to race, so they don't want more days, they don't even want the same amount of days as this year. Let me make something clear, when I say Nordic, I am not talking management, I am talking Nordic the owner of the race track. Nordic needs to go. If you can't even break even running a race track, do everyone a favor and sell the joint. Putting things in perspective: horses will be running for purses in the last 3 Breeder's Cup races tomorrow pretty much equal to what horses ran for this entire year in 80 plus racing days at Fort Erie, but those 80 days keep food on the table for thousands of track employees. Speaking of Fort Erie, last night was their annual awards dinner. I attended it. There is a family atmosphere amongst the horsemen at Fort Erie, they all seem to know each other and care about each other. Horse of the year of course was the "Freak From Fort Erie," Frezacon. Mark Fournier was voted outstanding trainer by his peers, and he deserved it big time. A bit of a surprise was the winner of outstanding jockey as voted by their peers. It went to Regina Sealock. She has probably had more broken bones than anyone in the Fort Erie jocks room, yet even in her early 40's, she keeps getting back on the horse. She did have an excellent year getting the most from her mounts She is rarely on the favorite, so even seconds and thirds were accomplishments many times, and I don't think there is any jockey on the grounds better than her going two turns. I'm officially worse than a coin flipper as I've now fallen to 9-10-2 on the year. This week I like Tampa Bay minus 3 and a half, Denver minus 3, and St. Louis plus 3. NDP leader Howard Hampton claims Ontario is discriminating against native casinos by not allowing cards. Still no news on Fort Erie Race Track. The province has offered what MPP Kim Craitor is calling a solution to keep the struggling Fort Erie Race Track open next year. “It’s just a matter of the details being worked out,” Craitor said late Friday afternoon. He received a call from Premier Dalton McGuinty’s office yesterday morning, outlining steps the province is willing to take to maintain the viability of the track. Exactly how things are moving forward is not yet clear. Neither Craitor nor Mayor Doug Martin, who received a similar call, would elaborate on the plan brought forward. But Martin said he felt more optimistic about the future of the 110-year-old border oval after speaking to officials. Track owner Nordic Gaming – which has a $300-million revitalization project on the table – has called on the province to provide a larger share of revenue from the slots side of the track facility for the next two seasons to bolster race purses and help offset operating costs while the plan is in development. There is no doubt that Fort Erie Race Track is going to stay open next year, the doubt was, and still is, how many days are they to run and this is based on how much purse account will be available. Fort Erie has until Halloween to submit their race dates for next year. I still don't see the government giving funds to an actual private owner (Nordic), but I do see the government giving a bigger cut from the slot winnings to go directly to purse increases, and possibly (thought I disagree with this too) to do race track upgrades. I still don't see this $300 million project as being feasible even if Nordic Gaming was sincere in putting that kind of money into it (I would be shocked if Nordic intended to put one dime of their money into the project). I do believe strongly that the original reason for slots is getting lost, and the race track needs to remain economically viable for the horsemen, so a bigger cut is essential not just for the next two years but the next 50 years, no matter who owns Fort Erie in the near future or beyond. I wonder if the government is really buying into Nordic's so called plan. $2,000,000 Canadian International runs tomorrow at Woodbine. And the winner will be...........Stream of Gold, just holding on. I wonder if tomorrow's total purses being offered is a record for a Woodbine (not including when they hosted the Breeder's Cup, of course). IRG May Have License Suspended In Oregon Youbet and IRG have separate licenses. 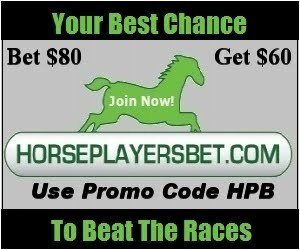 Railbird Blog illustrates the tight turns at Monmouth One of my readers asks whether WEG will pay the same prices that are paid out at Monmouth, because the takeouts are lower for a few wagers at Monmouth. It should be interesting. Slumping badly, I went 0-2-1 last week to bring me down to 500 after a great start. I'm now 8-8-2 on the year. Washington to blow out Arizona by more than 8 and a half. The NY Jets to cover against Cincinnati getting 6 and a half. Former Canada Revenue employee guilty of diverting more than $130,000 in fake tax returns in order to feed her gambling habit. Several ADW's don't have Breeder's Cup contracts yet. Premier Turf Club does have one. And I thought WEG called PTC a rogue organization. ORC: WEG can't drop Sunday race dates ORC is showing that they aren't WEG's puppets anymore. No Mr. Kaplan, the fact that tracks don't have turnstiles isn't why horse racing is stagnant at best. It is track takeout that keeps people from getting interested anymore. Ted Labanowich passes. NFL picks for week 6. Ted Labanowich dies at 74, after a battle with stomach cancer He was a hard guy not to like and a fellow speed figure handicapper. I wonder if he kept his old interview tapes. He will be missed. Bye Ted. Tote problems at the Windsor Hub caused a refund for people who bet on Woodbine's third race at Fort Erie race track last Monday. It took the track more than an hour to make the announcement. By then, pretty much the only people holding tickets that could be refunded were those holding winning tickets (or at least, they thought they were winning tickets). Most tickets were discarded on the floor or in the garbage. How can Tampa Bay be favored over anyone with their key injuries? Something is fishy here. And bookies don't lose money. Take Tampa Bay and lay the 3 points over Tennessee. I like the Jets are getting 3 and a half at home to Philly. Philly is erratic, and the Jets seem to be respectable against non top teams (and Philly is not a top team this year). I love Atlanta this week getting 3 and a half at home to the Giants. The Giants were all but written off without Tiki, but they have found a way to win. That being said, they are too conservative and the game will most likely come down to a game winning field goal. Atlanta looks respectable and they are underrated going into this game. Last Monday night's game between Dallas and Buffalo has to rank up their in one of the greatest/weirdest games of all times. It was completely entertaining to watch right down to the end...I think even for those who laid more than two touchdowns betting Dallas....maybe not....but that would be a shame. I still can't believe John Henry got up. I'm not sure, but I think that it was one Arlington Million, maybe this one, that became the first simulcast wagering event that could be bet on by patrons at Woodbine. I'm thinking 1982 or 1983. This one was in 1981. They plan to race 165 days a year without slots? Magna has already figured it out. Without slots, racing has no chance. What do these new owners know that Stronach doesn't? Racing scandal involving Fallon shows how dirty and dishonest racing can potentially be. OTTAWA - A Liberal MP is calling for a parliamentary probe into horse racing's federal regulator after allegations that it failed to act on infractions by the country's top racetrack operator. Wayne Easter wants the House of Commons agriculture committee to look into the workings of the Canadian Pari-Mutuel Agency to "get to the bottom" of concerns the agency is failing to protect the betting public. Easter was recently contacted by an officer with the agency who said he was ordered to suspend an investigation after submitting a report that found infractions by Woodbine Entertainment Group, which runs Ontario's Woodbine and Mohawk racetracks. The problems related to incorrect harness-racing betting information and the reporting of betting-related complaints. "Something smells here," said Easter, the Liberal agriculture critic. "(The agency) is there to basically be the overall watchdog of the industry to ensure that the statistics coming out in horse racing are accurate and people who participate in the gaming industry need to be ensured that the information they are receiving is indeed accurate." Easter wants to call veteran track officer Mark Halfacreed and his superiors as witnesses before the committee. He said the committee should also look into how employees at the agency are treated when they raise concerns about problems with the agency. Halfacreed filed a work report which found that "the betting public have been wagering on incorrect charted program information since 2004" and that the Ontario Racing Commission and Woodbine "ignored" a complaint about the information. The report concluded that "Woodbine has violated regulations" related to the reporting of complaints and betting information. But Halfacreed said he was ordered in an e-mail from the agency's Ontario director to drop an investigation into the matter. "I couldn't believe what I was reading," said Halfacreed, who has been with the agency since 1989. "I had already relayed the severity of the situation." The director informed him it was up to Woodbine to deal with the Ontario Racing Commission "if needed to put measures if deemed appropriate in place." "I consider this matter resolved in regard to further involvement by the CPMA," read the e-mail, dated Aug. 2, 2006. Track operators are required to report every betting-related complaint within 48 hours, according to agency guidelines. They are also required to publish six chart lines for each horse scheduled to run on a night's card. Chart lines are one of the most important pieces of data bettors use to decide where to put their money. Where they put their money influences the odds. The lines track a horse's position at four points throughout a race. Senior agency and ORC officials acknowledge there are no firm guidelines governing the accuracy of chart lines. The ORC and Standardbred Canada are working on implementing a process to accredit charters that could be in effect by next spring. There are also plans to nationalize accreditation. David Liston, the agency's associate executive director, defended the organization, saying Halfacreed was pulled off the case because officials believed the problem had been solved. "Based on discussions we had with the racetrack and some changes that had been made, we were satisfied that the new measures had resolved the issue." But the problems continued, Liston now acknowledges: "Hindsight is 20-20, and, as we became aware later that year, there were still issues and we acted on them." Liston said the agency never penalized Woodbine for failing to report the complaint because the company didn't understand the regulations. But, he added: "We made it absolutely clear that the obligation is to provide us with all complaints." Woodbine did not respond to requests for comment but it has since installed an electronic tracking system and hired the man who launched the complaint to oversee the accuracy of its charts. Professional horse player Jeh Stirling, however, does not believe anything would have changed if he had not pressed the issue or if Halfacreed had not gone to then-Ariculture Minister Chuck Strahl with his concerns last October. Stirling, 47, went to the agency in March 2006 after raising the harness-racing charting issue with Woodbine on repeated occasions over 23 months. "The system didn't work, period. I suggest someone does something to get the system working," said Stirling, who was hired by Woodbine last spring. Stirling said he believes the agency is in "a conflict of interest" by having its budget funding come from 0.8 per cent of every dollar bet. Halfacreed is now calling for a major overhaul of the agency that would include an audit by Auditor General Sheila Fraser and a change in the way the agency is funded. Agriculture Minister Gerry Ritz' office referred queries to the agriculture department. Does anyone else think that trainers who send over the "wrong horse" for a published workout should get more than a $5000 fine? How about a year to 5 year suspension? The betting public needs more protection. Opinion on the the Sealy Hill reversal: Can football games outcomes be reversed because of bad calls? No. The same should apply to Ontario horse racing. The bettors of Sealy Hill don't feel very good about this reversal from a betting standpoint. Still no commitment regarding Fort Erie's request for a bigger cut from the OLG. I went 1 for 3 last week which makes my total for the year a respectable 8-3-1. New Orleans by 3 is due for a blowout victory. Lets see how Reggie Bush can do without Deuce. Is Kansas City really underrated? Take the 2 points at home against Jacksonville and find out. Houston giving 5 to Miami. Someone knows something. Houston will romp. Windsor Raceway to focus on the customer in hopes of getting some new regulars. Presque Isle Downs averaged $585 thousand a day in handle, while they gave out $432,000 in purses. What a pathetic handle. The track operators must be way out to lunch. Arkansas racetracks can allow slots. They already have Instant Racing which has been a boon for the purse accounts. Friday night's 6th race at Rideau Carleton declared no contest. One horse went off stride going into the first turn causing a chain reaction of horses falling. No driver or horse was hurt. What could have been bet on that race anyway? Two or three grand? Todays hot rumour: A well known trainer at Woodbine was fined a good chunk of dough for calling in the wrong horse on a workout. I checked the ORC site and I can't find a link that gives info on fines and suspensions for Ontario tracks. Is this information available to the general public, and if so, where is it? And if not, why not?